We are a leading service provider for the Basic Gemmology Courses. The first step in learning about gems is its categorization. The next step is to learn the terminology of gemstones and then their physical and optical properties, and how those properties are used to identify gems. After getting the background one can proceed into gem identification. 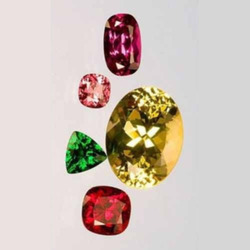 Studies relating to this field are gem cutting, sorting, grading, valuation and identification of gemstones, fashion, computer pattern designing, jewellery making, consultancy regarding stones, selling etc. While Gemmologists study the quality, characteristics and value of gem stones, Jewelers typically do the handiwork required to produce a piece of Jewellery. Gemmologists identifies the gems and advises the jeweller about the compatibility of gems to particular metals. In Jewellery, identification is one of the key element of business. Some rubies and garnets sometimes look alike, but their values are considerably different, only a Gemmologists can easily identify the difference and know its physical characteristic and value. In India the Gems & Jewellery scenario is undergoing a positive change with diamonds and stones like Tanzanite, Tourmalines, Peridots dominating the consumer preference. At the same time traditionally preferred Gems like Rubies, Sapphires and Emeralds have maintained a consistent position. From trade point of view Gems & Jewellery has been one of the biggest foreign exchange earner for India. It is therefore, highly necessary that people associated with the trade, receive training and carry out the operations scientifically and professionally so as to achieve greater success. Looking for Basic Gemmology Courses ?